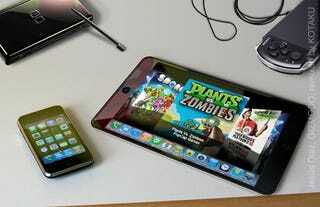 Which EA Games Can We Expect To See On Apple's Tablet? Word on the street is that Electronic Arts is going to have a big presence when Apple gets around to unveiling its tablet computer next week. So let's take a look at some of the games we'll hopefully be seeing. While conjecture has settled on the device being little more than a giant iPhone, both in terms of input (almost entirely through the touch-screen) and its operating system, there's one key difference at play: the size of the screen. Because the tablet will be a larger device, the iPhone's cramped display is a thing of the past. Not only will gamers have finer control with their finger movements, but there'll be more room for buttons and menus, and more room for finger gestures. So not only will the tablet be able to run more kinds of games, those games won't suffer as harshly as iPhone titles have when substituting a mouse or control pad for the swiping of a finger. Throw in the expected increase in performance over an iPhone and the tablet is a far more formidable gaming platform than most people are giving it credit for at the moment. With that in mind, then, here are some of the game's we're hoping EA has ready to unveil next week. The Sims - Duh. One of the world's most popular franchises is already available on the iPhone, but it's a bare-bones experience. With the screen-size to include all the PC version's menu commands, The Sims could be brought to the tablet with minimal fuss. SimCity - Another big EA franchise that's already on the iPhone, SimCity would require even less re-working than The Sims. Just take the existing handheld version (which is based on SimCity 3000), make the buttons smaller, add more menu commands on the single screen and you're good to go. Tiger Woods - Take the Wii version, replace the swinging of the Wii Remote with the swiping of your finger, and you're all set. Golf's a far more casual, and accessible a sports title than EA's other main franchises, and it'd be a nice way for EA to try and focus the world on his golf series and not his personal issues. Tetris - 100,000,000 is a big number, but it can always get bigger. Spore - Another no-brainer. It may have underwhelmed on PC due to its simplicity, but give people the ability to swipe around their planet on a glossy touch-screen and they'll snap it up. Sure, it won't fix the game itself, but it'll look cool in a demonstration, and at the moment, that's probably all Apple - or EA - care about. Battleforge - Came and went on PC with nary a soul noticing, but EA's fantasy card-battling game could find a second lease of life on the tablet. Sell the game for $10, then charge tiny amounts for decks of cards...it'll be death by microtransaction, and Battleforge's failings as a strategy game won't b e as obvious on a platform where the competition isn't as fierce. Ultima - Might not be ready next week, granted, but the tablet seems the perfect platform to dig up the Ultima brand and let some young, upstart developer craft a new title in the spirit of Ultima VIII. Simple graphics, cheap development costs, little risk. Just the way big publishers like it. See a pattern above? All those games use menus, or involve gestures - performed either by a Wii Remote or mouse - that can be easily replicated on a touch-screen. They're games that will work on the tablet. What we don't want to see is pretty much anything else EA has to offer. Madden, FIFA, Mirror's Edge, Battlefield, Medal Of Honor...basically anything that requires a d-pad, analog stick or mouse & keyboard combo to control. iPhone games have shown that forcing stick or d-pad controls onto a touch-screen is a terrible solution, resulting in games that are needlessly frustrating and difficult to control. So when Apple take to the stage on January 27 and unveil the tablet - and EA is shown off as a major backer of the device, just like it is on the iPhone - here's hoping the publisher has learned from the iPhone's mistakes, and has a slate of games ready that make the most of the tablet's (potential) strengths. And who knows. If we're lucky, we might even get a new piece of IP.